Hawaiian Government Survey, W.D. Alexander. Surveyor- General.Maui Hawaiian Islands. This very large, rare, and extraordinary 1885 map of the island of Maui, Hawaii, was prepared for the 1906 Report of the Governor of the Territory of Hawaii to the Secretary of the Interior. Covers the entire island in stupendous detail. 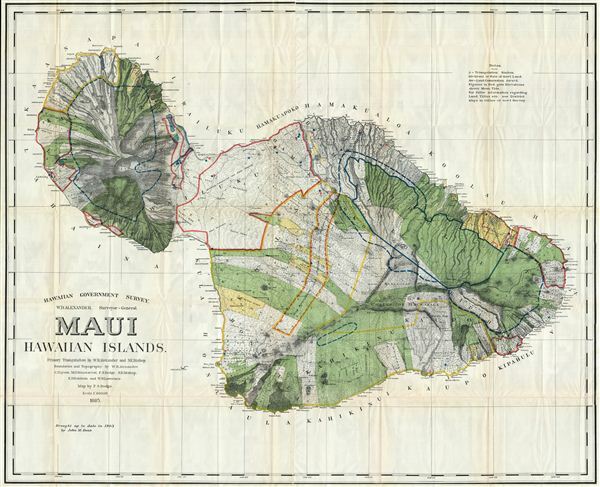 Though the cartographic work that produced this map was started in 1885, during the Hawaiian Monarchy, the map itself, and the report that contained it, was issued following the U.S. Government's 1898 annexation of the Hawaiian Republic. The Report was an attempt to assess and examine the newly created Hawaiian Territory's potential for proper administration and development. Consequently the map focuses on Public Lands, Homestead Settlement Tracts, Grazing Lands, Pineapple Lands, Sugar Plantations, Forest Reserves, Forest Lands, Wet Lands, etc. It also features both practical and topographic details for use in administering the region. The governor at this time was George R. Carter. The primary triangulation for this map was accomplished by W.D. Alexander and S.E. Bishop. The topography is the word of W.D. Alexander, C. J. Lyons, M. D. Monsarrat, F.S. Dodge, S. E. Bishop, E.D. Baldwin and W. R> Lawrence. The map was drawn by F. S. Dodge. Report of the Governor of the Territory of Hawaii to the Secretary of the Interior, (1906 edition). Very good condition. Minor discoloration on original fold lines. Minor transference. Blank on verso. Library of Congress Geography and Map Division Washington, G4382.M3 1885 .D6.